In this topic, we'll see how to create an icon from a GIF file. This image file format, which contains transparency like icons, is widely used on Internet to illustrate website. As a result creating icons from GIF file is an interesting way to create nice icons in a snap. To read more about icons, see this topic: "What is an icon?". Creating an icon from a GIF file does NOT change the Copyright or Intellectual Property of the original artwork. The GIF image is property of the author and still property of this author after a conversion to icon. As a result, do NOT redistribute icons created from GIF files without permission of the author. Please respect the author and do not convert his images to icons if you're not authorized (even for your personal use). Before opening the GIF file in IconWorkshop, it must be located in a known location on your hard disk. If you want to use a GIF file from a website, open the page from your Internet Browser then save the file on your computer local disk (see the Internet Browser help to learn how to save an image on your disk). 1. Choose "File/Open", browse your folders and select your file (Windows standard dialog box). To create a Macintosh icon, the procedure is similar: Click the Apple button (just next to the Windows button) or press "M". 7. In the Image Formats group, select the image formats you whish to add in the icon ( ) and unselect the unwanted images. Just click on the image preview to select/unselect. 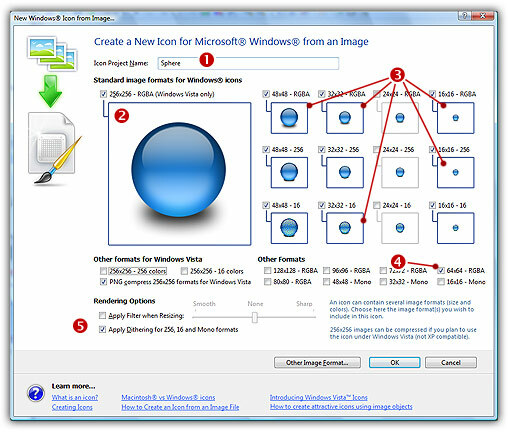 To know more about the desired Windows standard image format, see What is an Icon topic. 9. When done, click OK. The icon is automatically created with the various image formats you've selected. Save your icon. You're done!